As a lawyer in his younger days, breeder Mick Goss will be familiar with the Latin phrase, “annus horribilis.” The words (“horrible year”) were famously used by Queen Elizabeth in a speech at the Guildhall in 1992, but fast forward 24 years and they certainly apply to the Summerhill Stud supremo. 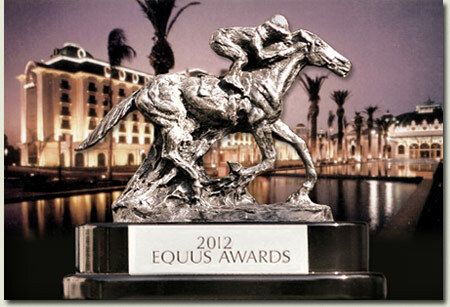 The winners of the 2014-2015 Equus Awards will be announced at Emperors Palace on 11 August. Results from the 2014 Equus Awards staged at Emperors Palace. Sentiment versus performance will be the question facing the panel of judges tasked with selecting the Horse Of The Year to be named at the 2014 Equus Awards next Wednesday at Emperors Palace. The TimesWe won’t be hearing strangled renderings of Auld Lang Syne echoing through the racing barns of the land, but the year has indeed run its course, a new one has begun, and celebratory thrashes are being enjoyed. We’re talking, of course, about the changing of the racing year on August 1 - the start of the 2013/14 season. It’s often said that racing exists in a world of its own, and there’s truth in that. It’s a magnificent obsession for many protagonists, consuming their lives and leaving them with little time to reflect on that other tedious stuff that makes up the world around them. Having their own year, at 180 degrees from everyone else’s, rather confirms this idea of a bunch apart. Not that racing folk are unfriendly. Oh no. But they’ve got so much to do to get those darn horses running for them that they can seem a little distracted. Take the racehorse trainer, for example, who works longer, harder hours than most people in other jobs (certainly journalism). He’s up in the small hours for morning gallops; then supervises feeding, grooming, medical attention, farriery, mucking-out, lunging, afternoon walking, admin, bedding, feeding again, more nursing, blanketing and even a soothing good night word for the valuable resident of each box to waft the dopey critter off to sleep. Many other players, even punters, are also absorbed in their herculean, time-consuming tasks of making a living from a frantic, fragile, frustrating business. Some find great success and become champions - and they’re the ones partying right now and who will receive Equus Awards anon. Mighty Mike de Kock retained the champion trainer title, just pipping challenger Sean Tarry. Another icon of present day racing, Piere Strydom, was a runaway winner of the jockey championship - a title he dominated in the 1990s but hasn’t pursued in recent years. “Striker” notched up 210 winners, 51 more than the incumbent, Anton Marcus - who was troubled by injury. Summerhill Stud of Mooi River took the breeders’ championship for a ninth successive season in a photo-finish from Klawervlei of Bonnievale. The highlight of the Equus Awards banquet is always the Horse of the Year announcement. The pundit’s favourite is Variety Club, the wonder miler who was unbeaten in five races over the year, including two Group 1 contests. But there are other candidates, including Vodacom Durban July victor Heavy Metal, who also has two Group 1s to consider. Three-year-old filly Cherry On The Top grabbed the coveted and most-elusive Triple Tiara with nonchalance. Then there’s popular favourite Beach Beauty, a feisty little filly who landed two Group 1s and is owned by people who clubbed together to race her in memory of a beloved friend and relative who died prematurely. The 2013 Equus Awards were celebrated in a fine spirit of camaraderie Wednesday evening at a fitting banquet in the magnificent Theatre of Marcellus, Emperors Palace. The industry paid tribute to its Champions and top local and international achievers. Summerhill is extremely proud to have been awarded the coveted Equus Champion Breeder Award and we congratulate our fellow Champions in their respective categories. Summerhill CEOWhen I was growing up, convention decreed that when under pressure, you kept it to yourself, you internalised your thoughts and you worked it out. Being stoic about your struggles was the gentlemanly thing to do well into the late decades of the last century. Then suddenly doctors of the mind began to tell us that we should share our issues, that we should unburden ourselves of the weight on our shoulders. These days, it’s as though the world has turned a complete circle. People want to know how you feel, they want you to share your innermost thoughts, and so that’s what we’re going to do right now. In case you thought we were suffering some serious psychological disorder, be at peace. South Africa’s is about the most tightly-held Breeders’ Premiership on the planet, one which, since the beginning of recording, has been held by just six entities, and to the best of our knowledge in the pre-recording era, just one or two others have aspired to the mountaintop. Ours though is unique for a couple of other reasons, the first of which is our locality. Since the breeding of racehorses first kicked off in the Western Cape several centuries ago, no farm on this side of the Drakensberg had ever been there until we won our first title in the 2004/2005 season. We’d been close before, agonisingly so the previous year, but winning it was a milestone not only for Summerhill, but for the fabric of racehorse production across the country. At last it put to rest the widely-held theory that you couldn’t breed a decent horse in these parts, and we have to concede, it took more than a year or two for us to believe it was true, and that is was repeatable. The second unique feature of this championship, is that no farm has held it for eight consecutive years since the seemingly “interminable” reign of the famous Birch Brothers in the early 1980s. The title had resided with them ever since recordings began in 1947, and it was uninterrupted for 36 years. We can’t see a repeat of that in the modern era, given the depth, the power and the excellence of the opposition these days. Historically, the breeding of racehorses was the preserve of farmers, stockmen who lived on their farms, and raised horses as part of a mixed enterprise. They did so with limited means, and those that knew their stock best and applied the smartest of intuitions, climbed the mountain. These days, the world of racehorse breeding in South Africa is entirely different. It is dominated by big money and big business, people with the means to buy virtually what they want in the way of genetics, to acquire the best of land and to employ the best of management. The kind of people who used to own the farms in those days are now running them, and they have at their disposal the personnel, the equipment and all the trappings of big enterprise, at their disposal. 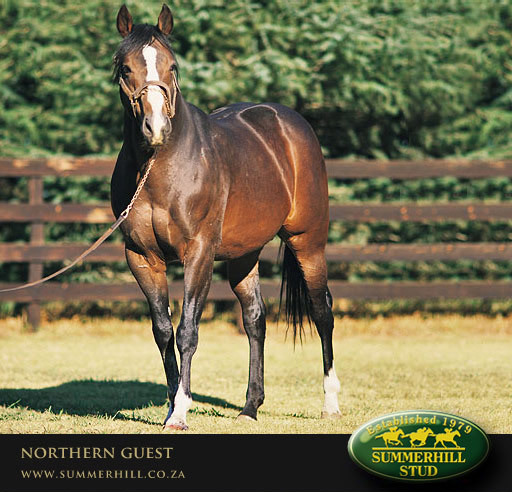 Summerhill stands on its own in the top half dozen studs in the land as a pure farming entity, funded through the endeavours of its people alone, and carried along by the achievements of the horses it raises. Few properties of Summerhill’s ilk finance themselves on the quality of their horsemen. These people know what they owe, and they understand the responsibility of living in the shadow of Giant’s Castle. If it does nothing else, Summerhill is a beacon for those who would want the world to be a better place, and who have hopes of one day repeating the feat. We used the word “eight” advisedly at the beginning of this story, because it isn’t “nine” yet. Technically, it’s still possible for our pursuers to get their hands on the pot of gold, but with a lead of marginally more than R300,000 this morning, and just two days to go, we’d rather be sitting in our seat than anyone else’s. It’s been a close run thing, and it’s been a clean-run thing, and for that we must thank our competitors. It’s a compliment to them and their efforts, that we’ll have to hold our cheers until midnight on Wednesday, lest we should “lose our ventures”. Editor’s note: Business Manager Ferdi Heinen, last evening, put together a projection of what principal rivals, Klawervlei, will need to do today and tomorrow to wrest the title from us with their engaged runners. The exercise assumes Summerhill will have no earnings in that time. If you’ve been reading these columns, you already know the bursting pride with which Summerhill is celebrating its eighth consecutive Breeder’s Championship. This is a country with a rich tradition in horsemanship, and we are surrounded in the racing game with professionals whose talents match those of others across the world. We’ve often pointed to the achievements of our trainers in the international realm, and the fact that one of the most sought-after jockey’s titles, (Hong Kong), has been in South African hands for 19 of the past 20 years. It follows then, that back at home, you can expect matching achievements among those who ply their trade in South Africa, and there are several. Lest he should be lost in the wash, the winningmost achiever is Northern Guest, Summerhill’s most famous resident of all-time. He clinched his tenth Broodmare Sires’ title this year, beating the modern day record of Mr. Prospector in the process. Mike de Kock ascended to his seventh Trainer’s title, his third in a row, and to put these into perspective, remember, several of his best horses are abroad, yet his earnings this season were almost 50% better than his nearest pursuer. Jet Master made it six Sires’ premierships, with five Group One winners - quite astounding! In any normal year, horses like Silvano and Var, who chalked up the most stakes winners with two champions respectively, would’ve been standouts; but they were relatively pale by comparison with Jet Master, who should finally be recognised as “the greatest stallion of all time”. We need to recall here that he was a R15,000 weanling, that there were no stakes winners in his first four dams (the family resided here, so we know it intimately), and that he has made it in the most competitive stallion environment in our history. Markus and Ingrid Jooste have aspired to their fifth Owner’s title, and Anton Marcus, who contributed handsomely to that award, took the Jockey’s Championship for the second year running. Spare a thought here for young Gavin Lerena, who rode his heart out (and broke it in the process), in going down by one winner on the last day of the season. Both these fellows were exemplary in their professionalism, and both are grand ambassadors for the game. Lerena will have his day, and many of them to boot, but for now, Anton continues to be the standard by which our jockeys are measured, not only for his riding talents, but for elevating the profession from the perspective of his conduct, his gentlemanliness and the adage that there’s no substitute for hard work. To be awarded following final voting. South African horseracing’s Equus Awards for the 2009-2010 season were presented by Racing South Africa at a plush black-tie function at Emperors Palace last night and the coveted “Horse of the Year” title went to the Millenium Stud-bred son of Dynasty, Irish Flame, who is owned by Larry Nestadt, Bernard Kantor, Gary Barber and Percy von Molendorff and trained by Mike de Kock. 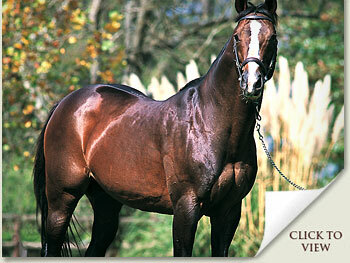 Nicci Garner writes that Irish Flame was a revelation during the 2009-10 racing season. He started his career with Dean Kannemeyer in the Cape and won three of his first four starts, including the Politician Stakes. After running a disappointing race behind Bravura in the Investec Cape Derby, original owner Percy von Molendorff sold a majority share in him to Larry Nestadt, Bernard Kantor and Gary Barber and he was transferred to the Highveld yard of champion trainer Mike de Kock in March. Irish Flame then proceeded to set the world alight and some two months after his arrival in Johannesburg landed his first Grade 1 win when trouncing Triple Crown contender Pierre Jourdan in the SA Derby. He went on to win both the Grade 1 Daily News 2000 and Gold Circle Derby (Grade 2). He then very nearly won the country’s premier race, the Vodacom Durban July, but giving 0.5kg was thwarted by a length by his top-class stable companion Bold Silvano. Little wonder then, that the Equus Awards panel not only voted him “Horse of the Year” but his owners received two other awards for their star runner - Champion Three-Year-Old Colt / Gelding and Champion Stayer. Bold Silvano’s connections, Sheikh Mohammed bin Khalifa Al Maktoum and Gill Thomson, were not left out of the Equus Award celebrations because their Silvano colt was voted Champion Middle-Distance Horse. The Mike de Kock stable dominated the awards, taking home nine trophies. De Kock took the Champion Trainer award after his runners earned a record R22.2 million in stakes and he also trains the champion two-year-old and three-year-old fillies for last season in Mahbooba and Here To Win respectively as well as the champion older filly or mare, Mother Russia. Irish Flame, Bold Silvano, Here To Win and Mahbooba are en-route to Dubai and Mike de Kock has big plans for them in the desert. In addition, Lizard’s Desire’s breeder, Albert Boshoff, received a the Thoroughbred Breeders’ Association’s International Achievement Award. De Kock, of course, handled Lizard’s Desire’s overseas campaign and the Lizard Island gelding, who is still fighting off life-threatening laminitis, finished a close second in both the Dubai World Cup and the QEII Cup in Hong Kong before winning the Singapore Airlines International Cup. Many experts believed that lightning-fast J J The Jet Plane had done enough in winning two G1 races - the Golden Horse Casino Sprint and the Mercury Sprint - to win the Horse Of The Year title. While they will be disappointed the country’s highest-ranked horse did not get the award, they can take comfort in the two trophies the Jet Master gelding’s connections did receive. He was named Champion Sprinter and Champion Older Male. JJ The Jet Plane was bred by Pat Devine and is owned by Hennie du Preez, Coenie Strydom, Thea Boyens and his trainer, Lucky Houdalakis. 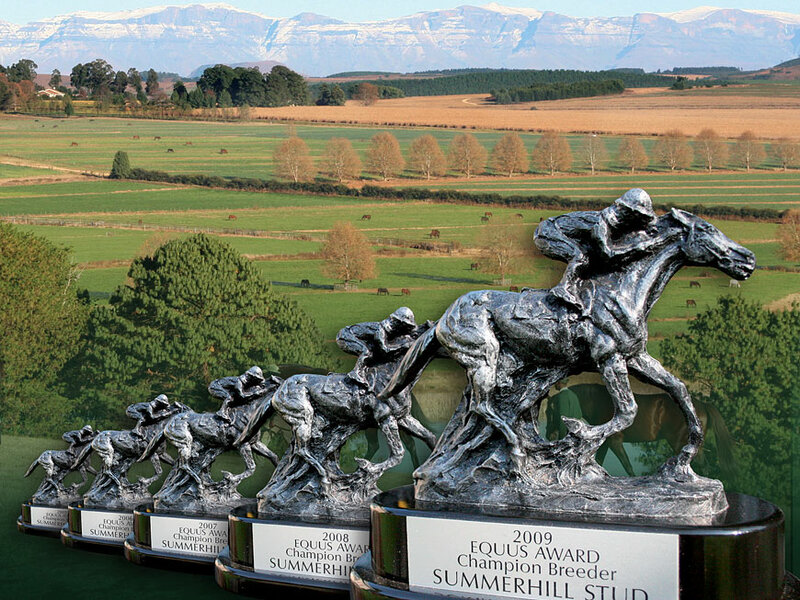 Summerhill Stud secured the Champion Breeder Award for the sixth consecutive year and newly crowned South African record holder, Hear The Drums, won the Equus Award for Outstanding Achievement. The awards were decided by a panel chaired by Phumelela’s Betting Executive Vee Moodley. The voting panel comprised Phumelela Horseracing Executive Patrick Davis, Gold Circle Chief Operating Officer Graeme Hawkins, Phumelela Marketing and Communications Manager Robert Garner, Tellytrack head Nico Kritsiotis, Form Organisation’s Jehan Malherbe, KZN commentator Sheldon Peters and the National Horseracing Authority’s chief handicapper Roger Smith. As we write, the Summerhill delegation of twelve is bussing its way to Jo’burg, for this evening’s gala function, which hails the Champions of 2010. It has been a banner year for racing, featuring one of history’s strongest crop of Three-Year-Old Colts, headed by the season’s biggest earner Pierre Jourdan, bred and raised at Summerhill by the Farm and His Highness Sheikh Mohammed Bin Khalifa Al Maktoum. He is joined on the podium by Irish Flame, Bold Silvano, Noordhoek Flyer, Bravura and Orbison. It must be decades since any category of finalists was adorned with such illustrious names. Of course, lest anybody should think we’re getting complacent, we’re as excited about the 6th consecutive National Breeders’ title as we were the first time our team occupied the stage. This time, our leadership of the breeding ranks is punctuated by a record margin of more than R10million, and the added lustre that comes with Hear The Drums, eclipsing the all-time record number of wins, just a few days before the season’s end - and our most famous resident, Northern Guest’s world record-equalling 9th Broodmare Sire’s title. The Equus Awards will for the first time be sponsored by Racing South Africa, the company established to represent the major stakeholders of South African horseracing and breeding; namely the breeders, operators and owners. This black tie event will honour last season’s Champions and will be staged at the Emperors Palace Centre Court in Johannesburg on Thursday, 12 August 2010. The format for this year’s Equus Awards takes on a very different feel with presentations being conducted in a cinematic environment with the opulent Banquet following and the coveted “Horse Of The Year” award to be announced at the end of dinner by Racing South Africa Chairman, Mr Vidrik Thurling. Longstanding Chairman of the organizing committee, Mr Larry Wainstein, is confident guests will enjoy the changes and all is set for an evening of great celebration! The 2010 voting panel consists of Vee Moodley (Chairman), Patrick Davis, Graeme Hawkins, Robert Garner, Nico Kritsiotis, Jehan Malherbe, Sheldon Peters and Roger Smith. 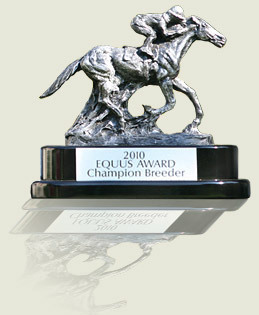 The least heralded of last week’s National Championships was that of theleading Broodmare Sire for the past season, yet in Northern Guest’s eighth consecutive title, he went where no other South African Broodmare Sire has been, and he needs only one more championship to equal the world record held by Mr. Prospector in the United States. Many chapters have been written about his influence on this farm and its affairs, not the least of which that his daughters have been major contributors to everything we’ve achieved here, including our fifth championship. That no other person or entity has ever won five consecutive Equus Awards in a single category says enough about that achievement, but it wouldn’t have happened were it not for the contributions of Northern Guest’s daughters. That said, we should remember at times like this that he altered the commercial landscape in the stallion services trade, almost single-handedly redefining the territory and reshaping the terms of business, as well as the number of mares a stallion could handle in a season, forever. Long before he became a national treasure, the news broke that his two world class Champion brothers, Try My Best and El Gran Senor, were both seriously low on fertility, and we still recall the day that Michael Watt, the then chairman of Britain’s greatest auction house, Tattersalls, wired us with the news and reminded us of the value of the asset we were sitting on. By then, Northern Guest’s first foals were on the ground, and while we hardly needed the reminder, this was a welcome reinforcement of the belief that perhaps, very early in our lives at Summerhill, we’d gotten “lucky”. For all his influence as a pre-eminent sire of champion juveniles in his later life, his first crop were slow to register their merit, and by the time he’d come to his fourth season, he was all but written off. And then they came, Senor Santa, Northern Princess, Rip Curl, Gun Drift, Mystery Guest, Gentleman Jones, Royal Thunder, Picture Search, Another Minstrel, _ _ bang, bang,one after another. And he’d hardly begun to register the Classic horses that were to follow. It was to be his distinction in the end that he should sire no fewer than six Grade One or Classic winning fillies (a portent of what was to become of them in the broodmare department, we guess,) and besides the later likes of Dance Every Dance, Golden Apple and Imperious Sue, who together with Angus made up (a pair ofJ&B Met winners, the one enduring memory which stands out, was the last great match race in South African history. One New Years Day, 1989, his November Handicap (Gr.1) winning daughter, Northern Princess got up in the dying strides to deny the perennial Champion Sprinter, Senor Santa for the biggest match prize in history. The “grudge” behind the race was the elimination of “The Senor” from South Africa’s richest mile event on the grounds of his brilliance as a sprinter and the unlikely fact he would stay the mile, yet all the race did was to prove once and for all, that the mile was well within his compass, a point he made so emphatically in the First National Bank Stakes (Gr.1) a year later over the gruelling 1600m at Turffontein. Not only did Northern Guest provide this farm with the profile all emerging operations would dream of, but such was the demand to visit his court, they came from every corner of the Southern African continent, and around us sprang up any number of new boarding farms, several of which are part of the enduring fabric of KwaZulu-Natal today. It’s arguable that Northern Guest did more for the creation of employment in this part of the thoroughbred world in his era than any collection of human beings did, and it’s a fact that there’s little on this farm today that was erected in his time, that he didn’t contribute to in one way or another. The fact is, for as long as there are races to be run and victories to be won, in our lifetime at least, his name will live on in the best pedigrees of the day. As it was in those days when he passed the Farm office on his way to his paddock at the end of the driveway, with his characteristic limp garnered in his younger days on Vincent O’Brien’s Ballydoyle gallops, the farm management are standing in salute. Our hats are off! There’s an old saying (the Afrikaans version of the “tall poppy” syndrome) that “die hoogste boom vang die meeste wind”, and for our foreign visitors, that means “the tallest tree catches the most wind”. That goes with the territory, and we accept it as our lot; that’s why you so seldom see any attempt at self-justification in these columns. Yet that doesn’t mean we should simply lie down and die. Our fans deserve to know the facts. Ever since the origin of racing’s championships, numbers have mattered, and if you look at the history of South African breeding, and those who’ve dominated, you’ll find it has been no different. The Birch Bros, one of the six entities to have held the title in all its history, are reputed to have won something approaching sixty times, yet their earnings (which is the basis for calculating the champion stud) were the sum of the contributions of three different families who traded under the name of Birch Brothers. The renowned Koster Bros earned their championships the same way, with contributions from the stock raised by several families. That shouldn’t detract from the undeniable truth that they bred a damn good horse, and plenty of them. We are a single entity, for what it’s worth, which had the necessity (and the enterprise, if we may say so,) to draw a broader church into our activities. Ominously for Summerhill, this season Klawervlei Stud are anticipating the arrival of the order of 240 foals, all of which will be registered as Klawerveli breds, almost double the number we’re anticipating foaling in the name of Summerhill. These, in the end, are overwhelming numbers, and how else could you meet that challenge, but through doing your level best and perhaps doing things differently, as we always have, and to a degree, by having the numbers. At last week’s gala function, in a magnanimous address as recipient of the Owner of The Year award, Klawervlei’s “senior partner”, Markus Jooste gave notice that they had their sights firmly on Summerhill’s title!. 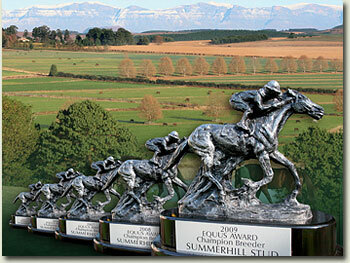 What our detractors overlook is that, despite the export of the five top runnersfrom this farm at the end of last season, we managed to achieve our Championship with earnings per runner not far short of R60 000, a figure which would’ve been significantly enhanced had the exports been retained on South African soil, contesting our best races. We speak of course, of the outstanding international performers of the past season, Imbongi, Art Of War, Paris Perfect, as well as Galant Gagnant and Desert Links, whose absence affected either our numbers or those of their sires (or both), to a marked degree. Two of them were not officially bred by Summerhill, but we’re proud to say they were graduates of our paddocks, and together with the Group One winning filly, Outcome (similarly bred here, but not under our banner), they signalled to the world the ongoing quality emerging from Summerhill. That we achieved this result with the “second” string, makes this year’s title all the more satisfying. Equally, in a recent observation on soundness, Robin Bruss pointed to the fact that Summerhill has the highest number of starts per horse in training, it’s worth adding that in recent seasons, we’ve been represented by the nation’s leading seven and eight year olds; Nhlavini(who holds the record of six consecutive appearances as a finalist at the Equus Awards), Red Carpet Style and Brigadier Parker, all of whom were Stakes winners in their dotage years. And right now, in fact this last weekend, Hear The Drums endorsed the durability of our graduates with his 26th victory, making him the winning-most racehorse in South Africa in the past thirty years. It’s easy to point fingers, but there are other means of achieving their own satisfaction for our critics, and that is to get on and make their own mark through the establishment of their own standards of excellence. That way, they’ll earn their personal fulfilment, and have less to worry about in the success of others. Just last month, Fortune magazine carried the stories of the twenty most successful Americans of the past few decades, and the best advice they had received. While we’ll provide a little more in time in the way of insights from these icons, it’s worth noting that Bill Gates emphasized the value of fanaticism (saying that it was underrated as a force in success), and that both he and Steve Jobs, the founder of Apple, were fanatical about certain things; Colin Powell speculated on the value of a work ethic, and what it took to become a successful general, and in the context of this article, perhaps the most sage advice came from Scott Boras. Boras is one of the most successful managers of sportsmen and celebrities of all time, and he related a story of the advice he received from his counsellor following victory in a court case at an early stage in his career. “You will find,” opined the counsellor, “that if you are especially effective at what you do, 95% of what is said about you will be negative”. We didn’t realise that things were that tough in our game, but if those that swipe at our championship are anywhere near those odds, we take it as a compliment.